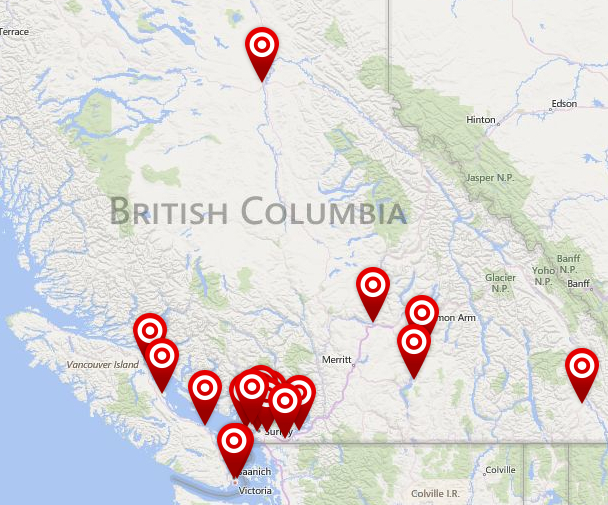 Jan. 15, 2015 8:00 a.m.
U.S. retailer Target is abandoning its short-lived foray into Canada. The company says it will close all 133 Canadian stores, including 19 in B.C.. It employs 17,600 people in Canada and the closures could throw thousands out of work in this province. Target chairman CEO Brian Cornell said there was no realistic scenario for the money-losing Canadian arm to reach profitability until at least 2021. It was granted protection from its creditors in Ontario Supreme Court Thursday. The Minneapolis-based retailer has B.C. locations in Campbell River, Courtenay, Nanaimo, Victoria, Saanich, Burnaby, Richmond, Coquitlam, Delta, Surrey, Langley, Maple Ridge, Abbotsford, Chilliwack, Kamloops, Kelowna, Vernon, Cranbrook and Prince George. Target stores will remain open during a court-supervised liquidation. Target is placing $70 million in an employee trust to ensure a minimum 16 weeks compensation, including wage and benefit coverage for workers not needed for the full wind-down period. The decision came after an unsuccessful holiday season, Cornell said, despite best efforts by Target Canada to win over shoppers. The American retail giant launched its Canadian expansion in 2013, buying up former Zellers locations and arranging grocery stock through Sobey’s. SFU business and marketing professor Lindsay Meredith said Target’s invasion of Canada was misguided from the start. It launched with too many stores at once, he said, and it immediately turned off Canadians savvy to lower U.S. pricing when it instead charged prices in line with Canadian retailers. “That was exactly what Canadians did not want to hear,” Meredith said. When stores opened they were missing some of the U.S. brands in home decor and fashion shoppers wanted, he added. Further blows that entrenched the retailer as a “screw-up” in Canadian minds included a massive data breach at the U.S. parent and recurring problems with empty store shelves. “Empty shelves is a retailer’s kiss of death,” he said. The latest challenge for Target has been the dive in the loonie to 84 cents U.S., which has left the company bridging a growing gap between what it pays for stock in the U.S. and what it sells it for in Canada. But Meredith said he was surprised Target opted for a complete Canadian pull-out, coupled with creditor protection, rather than what he calls a “hedge hog defence” of retrenching to a small number of more profitable stores in key markets. Big winners from Target’s demise will be established retail and grocery chains like Wal-Mart, Loblaws, Canadian Tire and even Sport Chek, Meredith predicted. He expects the stores will be sold piecemeal to multiple buyers “who will bite off a piece of the whale carcass” rather than to one replacement chain. Other retailers have also struggled lately, including Sears, and fashion outlets including Mexx, Jacob and Smart Set also intend to close. But Meredith said Target’s withdrawal will send a particularly strong warning to other U.S. retailers considering Canadian expansion, such as Nordstrom’s. United Food and Commercial Workers local 1518 spokesman Jason Mann said Target’s failure to hire former Zellers workers meant it lacked staff experience to make the operation work.